Delivering results on key national challenges inevitably involve multiple stakeholders and delivery partners, whether it involves the environment, transportation, healthcare, or social services. These are areas where systems are decentralized and the target population is diffuse. Coordination across policy areas like these has never been easy – or so important. This report focuses on a fairly defined target population – veterans of military service and their families. Yet, as the report’s authors note, the diffuse approach in delivering benefits and services to these individuals is incredibly complicated. The authors highlight the fact that there are more than 40,000 other groups – such as states, localities, non-profits – that also support our veterans. As a result, they advocate that the federal government take a more enterprise, or holistic, approach to serving veterans. In the report, they describe five building blocks for creating such an enterprise approach, and offer recommendations and specific actions to be taken. 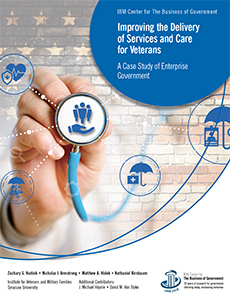 While this report focuses on the instance of creating an enterprise approach to serving veterans, the building blocks developed by the authors could be applied in other policy domains as well to address broad national challenges in a more integrated way. Read our blog on the report. Read our infographic on the report. * The authors also wish to acknowledge J. Michael Haynie and David M. Van Slyke for their thoughtful feedback and input provided throughout the course of this study.